In the fast-paced of the world today, many industries today uses formal email as means of communication to its clients, partners, and customers because of its efficiency and fast delivery. They find it so effective that they adopt their environment on using it. You can rarely see today offices using the memo to deliver information. 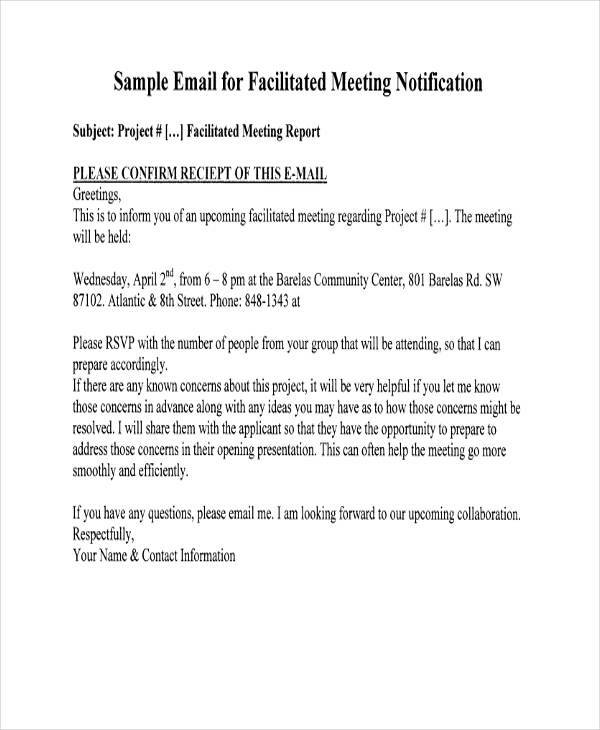 In setting up a meeting, using email has a huge impact. It makes it easy to communicate with the clients and it also makes it easier to find the perfect time to meet with them. It’s no doubt that professional email makes setting up meeting more faster and convenient. 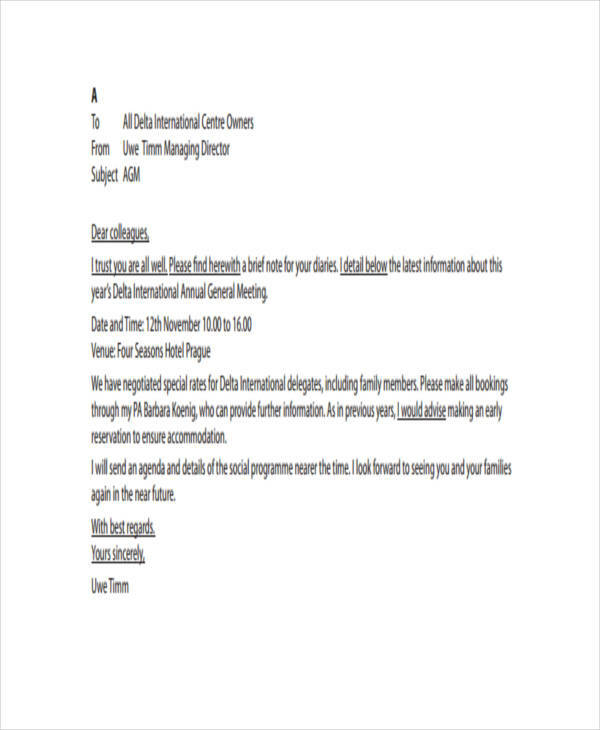 A meeting email is a letter sent to client or customer using the internet to request a meetup to talk about something related to their commitment, such as business venture, investment, possible sales email, and so on. Like in any almost email requesting for something, such as job application email, internship email or marketing email, meeting email has no difference in terms of writing it and its format. All email regardless of its uses should follow a business formal email etiquette. 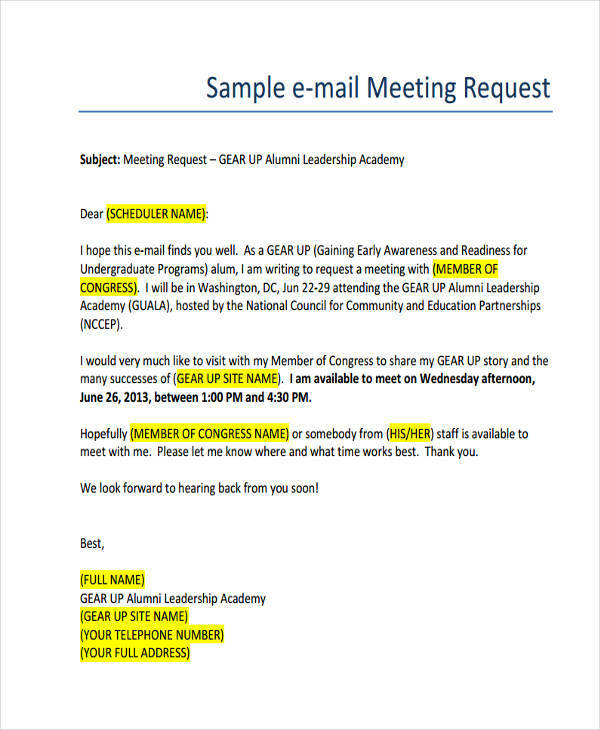 Here’s how to write a meeting email. It should start with the recipient’s details. This includes the recipient’s name and address, recipient’s title, and the contact details (if any). Followed by the date. It should be written in the right format. Next, write the proper salutation along with the recipient’s last name. 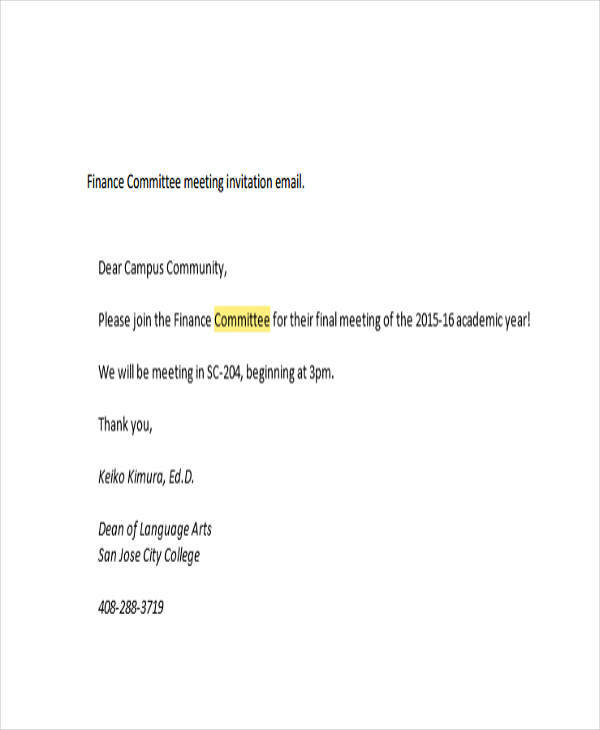 Write the subject of the letter on the first statement. Then, write the main content of your letter in the body. After that, end it with a closing remark. Below it is your name. Make it bold and readable. 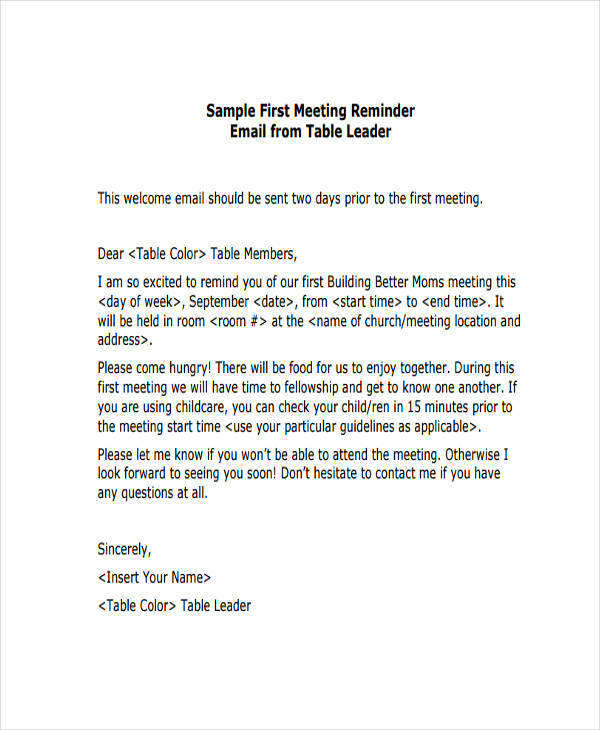 To give you more ideas on how it looks like, check out our meeting email examples here. There are hundreds of ways on how you can request a meeting with a client or a colleague. The important thing is that the meeting email should be a way for you and your recipient to have a conversation online that can then be turned into a face-to-face or phone conversation. 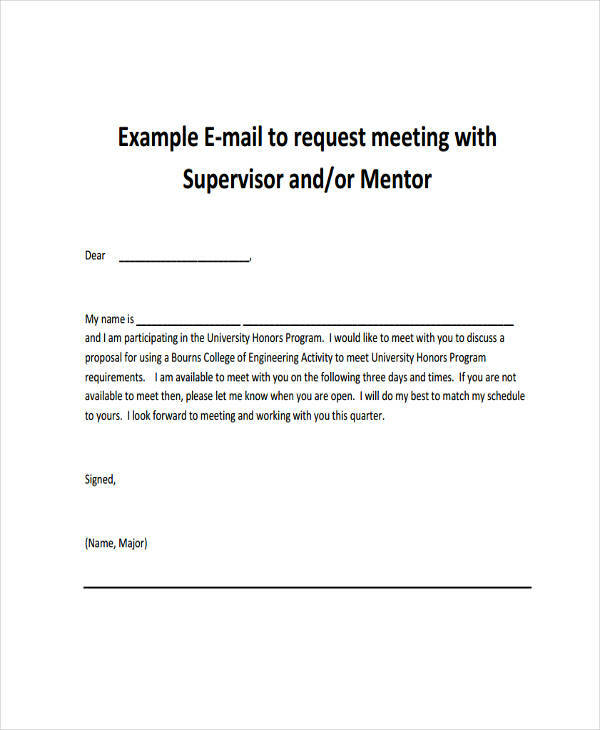 But, whatever reason it may be, you can follow the simple guidelines below to help you in creating a meeting email message. 1. Do not load your email with all sorts of information and then ask the recipient to agree with you or do complicated things. That is annoying to the recipient. Instead, make it short, to the point, and asks the absolute minimum from the recipient. Or better yet, ask a simple response. 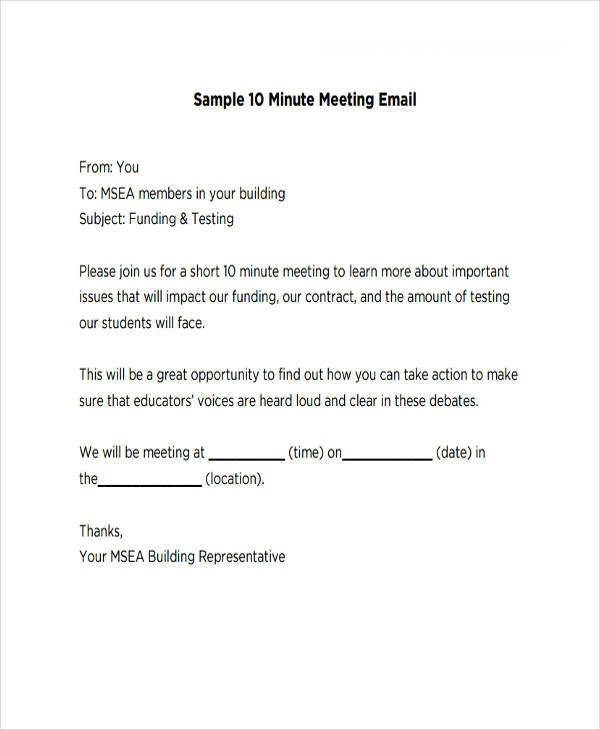 You may also see application email examples. 2. If your first email fails to get a response, it is okay to do a follow-up email. Just follow what you right in your first email, tweak it a little bit so you don’t sound pushy or in demand. 3. Let’s assume that you first email, gets a response, so you have to write a second email. This is where you set up for a meeting. The best way to do it is to simply ask for the commitment without specifics. Do not make it like your are so busy and can only meet up at a certain time and date. 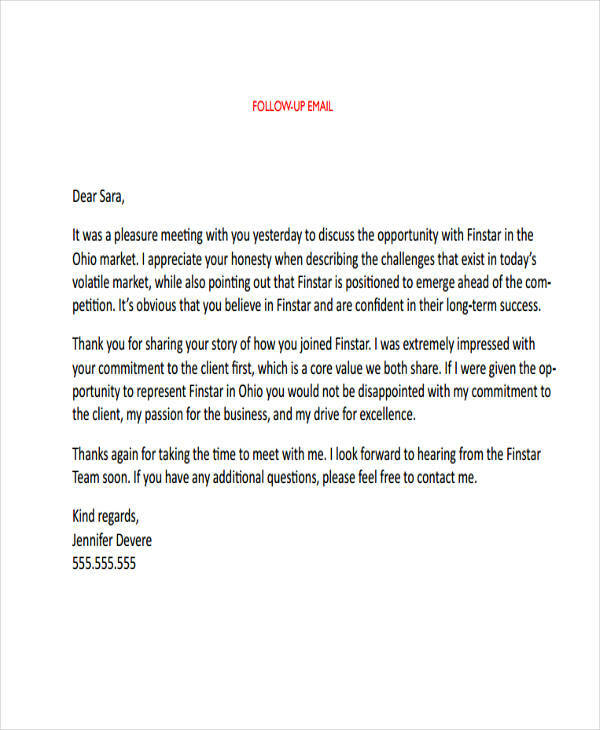 You may also like business email examples.